This adaptation of Richard Hoag's off-Broadway play deals with a man's confrontation with his own homosexuality in an unusual and stylized fashion. Starring Chuck Ports as the man, with supporting parts played by David Clemens, Sheila Cohen, Raymond Cole, Thomas Crawley, Fred Dykeman, Richard Hoag, Stephanie Moss, JoAnn Schuman, Michael Talcott, and Juliette Whitman. Written and directed by Richard Hoag. Produced by Charles Lewis and Baird Searles. Technical direction by Ed Woodard. 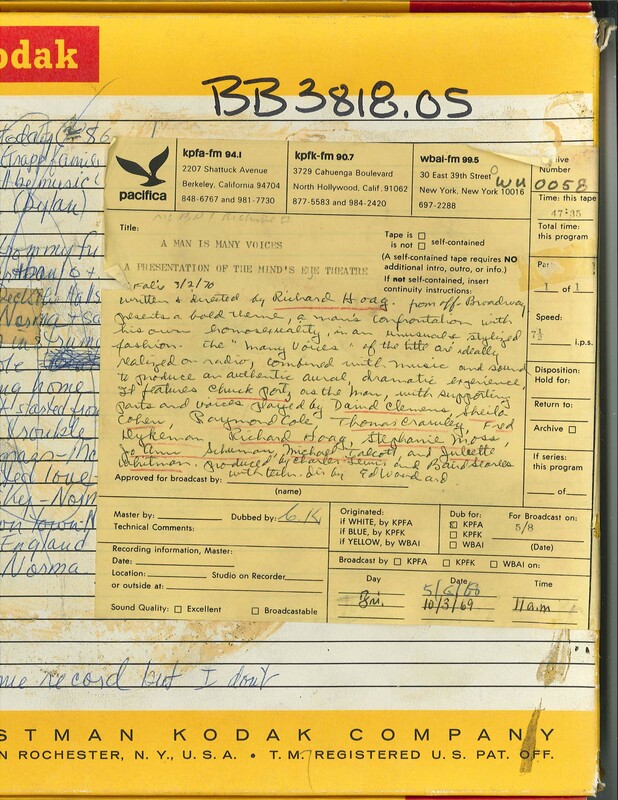 This recording was formerly cataloged as BB3818.05. 1 reel (48 min.) : 7 1/2 ips, mono.